This post follows our previous one outlining the fundamentals of “How To Follow” for beginners in partner dancing. This post does something similar with an emphasis on the interaction with your partner. Sometimes you are dancing on beat, sometimes you are 50-50 and sometimes you are in your own world dancing to an “amazing” rhythm no one else can hear. Sound familiar? If you and your partner are both true beginners, it takes time to develop rhythm recognition. Follow your partner along the best you can. A little theory. What does it mean to be “on time”, on the “right beat”? Most of the songs will be on “4” or “8” beat measure. Only the “Waltz” songs will be on 1,2,3 beat. So to be on time, first recognize the music. Is this is a 4 beat or is this a 3 beat song? Listen to the music. Count the music. Tap with you hand or leg or even snap with you fingers. Make a sound and match the sound with the music. Try a different song and repeat. If you are a beginner or advance dancer stay on time. No matter the style of dance, staying on time is one of the most important things you can do. P.S. If you partner is off beat, don’t do any “favors”. Stay on time. He or she will match you sooner or latter, be patient and polite. Frame is the positioning of your arms and body which creates room for you both to dance. Pressure is a light, but active, compression which you apply to your partner’s frame through the palms of your hand. If you aren’t responding fast enough to a lead, you might have to tune up or tune down your arms and body. Find the “Gold” middle. Both of these together create the connection, which is where the joy of partner dancing comes from – moving together in unity. 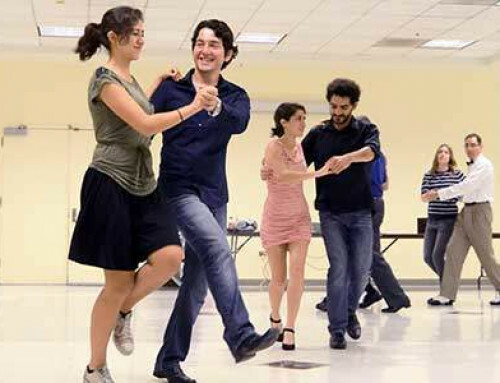 As the previous post and this one are meant to imply, the most difficult thing to master in ballroom dance – or any other kind of partner dancing – is NOT THE STEPS. It’s the interaction with your partner! It’s simply impossible for two people, dancing in close contact, to move seamlessly if each person makes their own decisions, choosing their own timing and making their steps independently. They must coordinate their moves perfectly – and the only way to achieve that is for a person to direct the moves and the other person to follow. Dancing is a conversation with no words.